The following videos contain two perspectives of a bird strike on an A-10 vertical stabilizer. The strike took place in late July 2007, during an air show above the Columbia River in Yakima, WA. 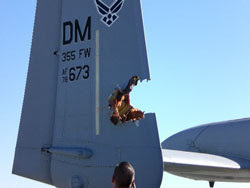 The aircraft struck the bird during airshow maneuvers, and after the strike the aircraft landed without further incident.